Initially I read this book based purely on its cool title (pardon the pun), but it quickly became apparent that a) this is a vampire novel and b) it’s actually pretty original for a genre that has been done to death (again with the puns!). Tana wakes after a huge house party to discover the grizzly mass murder of her friends; victims of vampires. The only survivors are herself, her ex-boyfriend Aidan and a half-mad, chained-up vampire named Gavriel. Aidan has been bitten, which means he is now infected, or ‘cold’, with the vampire virus and has the choice of suffering horrendously for 8 weeks while he battles the infection, or drink human blood and complete the transformation to vampire. Either way, Tana has no choice but to take Aidan to the nearest Coldtown, where he won’t be a threat to human life. At the last minute, Tana rescues Gavriel too, a mysterious and clearly powerful vampire with his own agenda and a strange attraction to Tana. What follows is an original take on Vampire Lore, vampire-human interactions, and a playful exploration of our infatuation for vampires in general. Coldtowns are not only ghettos set up to protect the human populace, but havens for vampires and their human groupies, not to mention reality TV for the world outside, with 24-hour live feeds to the eternal and sumptuous parties within. 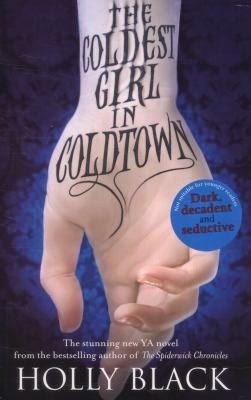 At this stage, The coldest girl in Coldtown has no planned sequel, and with an ending that leaves some unanswered questions, it will definitely stimulate your imagination for a long time afterwards.